Over the past decade, Mexico’s textile sector has derived some of its greatest benefits from tariff reductions that resulted from the country’s numerous free-trade agreements. That’s especially true in the U.S. market, where Mexico has been the leader for years. However, beginning in 2000, Mexico has faced growing competition from China. The Asian giant has provided headaches not only for the textile sector but for most Mexican businesses, taking a leading market share in U.S. textile markets. What steps can Mexico take to respond to this threat? From January through September 2004, U.S. imports of Mexican-made apparel reached $5.069 billion, 4.3% below the total registered for the same period in 2003, according to the CNIV, Mexico’s textile industry association. Meanwhile, U.S. imports of Chinese garments grew 21.7% during that period to reach $6.69 billion. An additional challenge can bring more headaches. If Mexico does not take the short-term measures that are required, it will lose an even larger slice of the U.S. market. On January 1, the World Trade Organization’s system of textile and apparel quotas expired. For years, the quotas limited China’s textile and apparel exports. Now, the WTO is forecasting that China could eventually produce more than half of the world’s textile products. Last year, China produced 17%. Mexico has free-trade pacts with 43 countries, one of the largest such networks in the world. However, Mexico’s free-trade network does not include China. For years, China has been considered an enemy that must be defeated, not a potential ally. It was not until last year that Mexico began to approach China in an effort to increase business and commercial ties with the Asian nation. Mexican experts believe that Mexico made a big mistake maintaining this negative view of China for so many years. “To some extent it was counterproductive,” says Antonio Ortiz Mena, director of the international studies division at CIDE, a prestigious research center in Mexico. “In effect, China is a threat, but it is also an opportunity. China is starting to be an important exporter of capital; in short, a foreign investor. China is buying companies, looking for joint-venture investments, and so forth. Even Mexico could take in Chinese capital. A bilateral treaty between Mexico and China, signed when China entered the WTO, allows Mexico to maintain compensatory quotas on 1,300 Chinese products until 2008. Near the end of 2004, China announced that it would impose taxes on exports of 148 textile products, beginning on January 1. The move was regarded as China’s effort to appease those who fear the end of the quota system will lead to an invasion of Chinese products worldwide. The Chinese will impose taxes on such products as underwear, pants, suits and overcoats, at rates ranging from 0.2 yuan (.02 cents) to 0.3 yuan per piece or ensemble. Accessories will be taxed at 0.5 yuan per kilogram. This was only one of eight initiatives announced by China’s commerce ministry in an effort to help industry adapt to free trade without suffering any sudden shocks. Other steps are designed to require Chinese textile companies to inform the government about their expansion plans; encourage Chinese companies to invest domestically, rather than expand overseas and stimulate development of local Chinese brands. Other countries, including the United Status, fear a wave of Chinese textiles. Last December, the U.S. announced that it will continue to restrict imports of some textile and apparel products after the quota system ends. The Committee for the Implementation of Textile Agreements, which comprises members of several U.S. government agencies, announced a plan that will permit specific textiles and clothing products to enter in stages. The chain of fiber-to-textile-to-apparel makes a strategic contribution to Mexico’s Gross Domestic Product and to its exports and investments. The sector is also vital to the country’s job generation. Integrated by links of chemical fibers, textiles and dressmaking, it is Mexico’s fourth-largest manufacturing activity. However, the sector began to lose steam last year. Consider the employment figures: In October 2004, the apparel industry provided 567,000 jobs, or 18,000 fewer jobs than in October 2003. 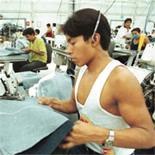 The North American Free Trade Agreement (NAFTA) of 1994 immediately eliminated all quotas for textile products and apparel that complied with the specific ‘rules of origin’ in the treaty. For textiles and apparel that did not comply with the rules of origin, a timetable was established for eliminating restrictions and designating levels of quantities. Using this timetable, the great majority of categories were freed from restrictions starting in 1994. Ten categories were deregulated within seven years and four categories within ten years. Starting on January 1, 2004, the United Status eliminated all restrictions and all designated quotas on imports of textiles and apparel products from Mexico. Yet Mexican-made products began to lose their competitiveness in the U.S. because taxes and tariffs on imports from other countries were also dropping. The fundamental problem is that a high percentage of Mexico’s exports in this sector involve only assembly, unlike Asia, where there is a greater integration of the production chain for textile products. In addition, Mexican production is highly concentrated in basic products with little added value. These days, global success stories usually involve more fashionable products that have higher added value. Labor costs in Mexico are also higher than in Asian nations. As if that were not enough, conditions for financing are unfavorable in Mexico, inhibiting foreign investors in the sector. Last October, the Mexican government cut tariffs on imports of raw materials used by textile manufacturers to help its industry compete more effectively with Asian producers. Tariffs fell to 10%, from an average rate of 18%. For Dussel Peters, the goal for this year is to find synergies and alliances that prevent industry from suffering a setback later on. “What are the options for Mexican producers? Short term, to increase their productivity through investments and joint ventures with capital from the United States, Europe, and above all, China,” he says.